Some times the date at the end of page differs! Most folks who have little experience in electronics aren't able to read schematics let alone soldering components onto a circuit board to get a working gadget. I am one of them. I am a Swiss Tool and Die Maker, have therefor little knowledge in electronics. 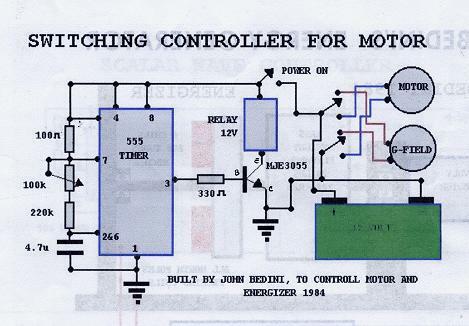 Looking at a schematic, it is evident that applying the proper mechanical and practical technique one can't possibly work it correctly without experience and proper schooling. Soldering components through a board did not work for me. I remember John's comment, the closer everything is soldered together, the better it works. Not until I omitted the board did it finally work. 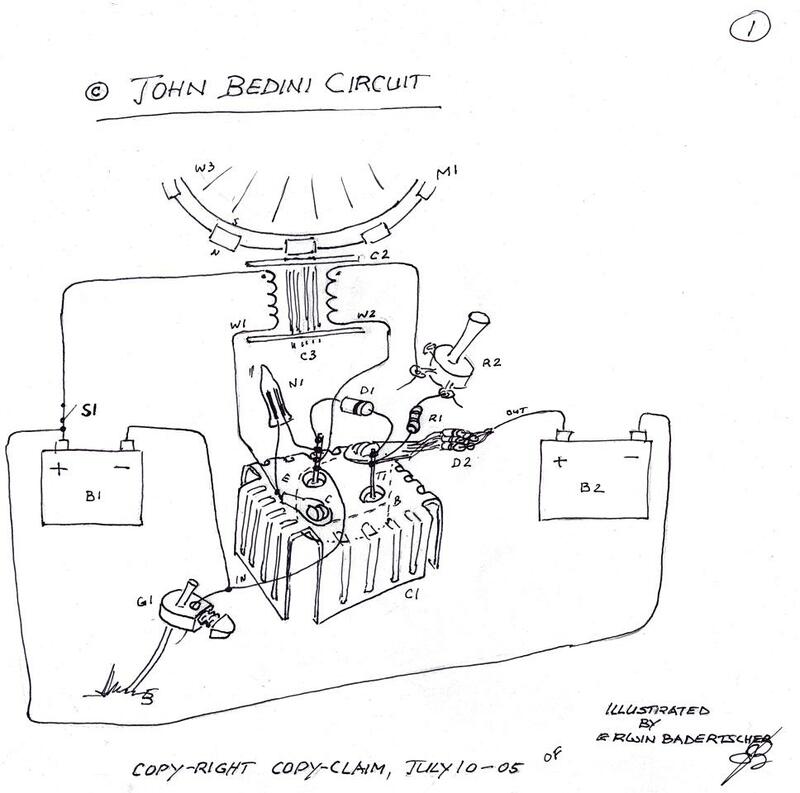 Once I figured out by trial and error, how to solder up the John Bedini Circuit, I made drawings for easy visualizing of the different soldering joints and component arrangements. Image 3 and 4 are such drawings. Click on them, select all, copy and paste into Word, if you do not have Windows Picture Tool in your browser, go to Windows View menu, tool bar, check off picture tool bar, click on text wrapping, click through, on the main tool bar reduce page size on your main bar from 100% to 25% go back to picture tool bar and click format picture (paint pail) size tab, scale from !00% to 80%, go to rotate left 90 degrees on the same tool bar, click to neutralize ------> print. What is a drawing good for if you can't read it? I know there are people who do not know how to extract and copy readable drawings out of a computer! I was one of them just a few months ago (Dec. 2005). I could not help noticing the very negative, sly and deceptive behavior of some people in these forums obviously with second agendas who are taught to meddle in, falsify Dada and discourage progress while doing a lot of misleading/deceptive talking getting you nowhere or being very busy not showing you enything you can truly learn from. With other words; if you nullify in your mind any negative and none productive comment concerning the Bedini technology or any subject for that matter and gather all positive threats, then you'll get some where. I learned not to open up any closed files (if you do, keep track of it) from those groups or answering individuals privately after I ended up with three Trojan horses and a I-Worm/Bagle in my AVG virus vault. Here is an example of what happens if people trust others in a forum. Several people of the forum had rotors machined by a certain machinist only to be disappointed and ended up complaining of poor workmanship and Rick even complained of the poor attitude the machinist had towards the forum list. I don't know about you , but I smell a rat here. I worked as a machinist for a number of years and can't fathom scrapping a simple rotor work peace on a dividing head index, never mind a whole bunch of them, unless done purposely!! Don't be surprised if your local machine shop either refuses to machine your rotor or runes it, because many owners have been bought by the elite. It happened to me twice in different shops of BC, even in the same town!!! "money talks". Best is to buy your own equipment. It will be well worth it. Remember this one, but no offense: Only a fool trusts people whom he does not know personally! Selfishness and a lack of love for the neighbor is the reason people can't be trusted. All negativity stems of the opponent and everything positive is of God our Creator. I find it interesting that the majority of folks are being led down the garden path because they are more willing to believe something out of the blue yonder, then what is written down and collected pertaining to truth. By knowing and striving for truth, the result of fraud becomes evident quite quickly! So, when Rick Friedrich started his Bedini Monopole Group on February 26 - 05, I was all "gong ho" and joined in. Message 51 was my first post. Rick is doing a fine job by the way. 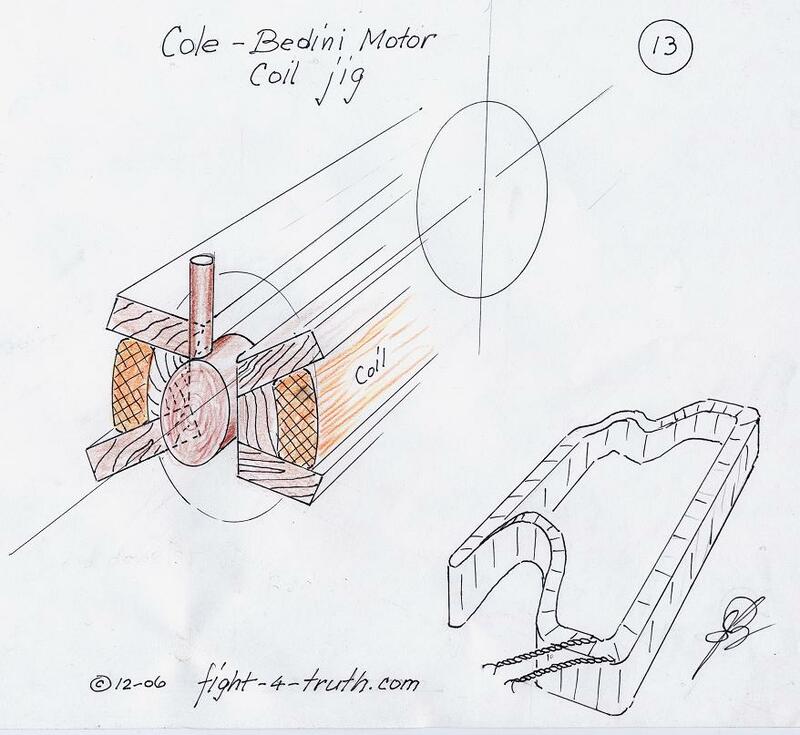 I have to admit that I was one of the many who asked John Bedini per email years ago how to build a coil and where to get the material needed, to which of course I too, never got an answer. I suspect this was part of the reason why JB is encouraging the group efforts. I was on the lookout a number of years, how to get into the Bedini Circuit and finally found it. While reading all those messages of which most of it was a waste of my time, I realized that upgrading was my only chance to get anywhere. I bought myself the book "Practical Electronics for Inventors" by Paul Scherz, McGraw-Hill, No. 3105 for $39.95 US http://www.lindsaybks.com/ 815 935 5353 fax 935 5477 (ask for catalog) and away I went. This book is for hands on electronics and worth every dollar, a must for the beginner. I expect of you to go the same route. You need to have at least knowledge about the function of the individual electronic components, in order to succeed, since step by step instructions for free are hard to come by; although better now with the Internet. for learning, testing and self preservation. Image 3 (SSG) This is what you start out with if you are new to the Technology. At the same time I am pointing out to you a mistake I made out of slow comprehension. Since the 2N3055 tophat transistors have only two terminals "base" and "emmiter" the mounting base "power in" is also the collector terminal, I got into the habit by placing the coil power- strands to the heat sink which is the collector and case of the 2N3005. Consequently when I moved on to the BD243C I connected to the heatsink instead the proper transistor collector terminal. Interestingly I haven't noticed much difference even when it comes to soldering the strand to the proper transistor terminal, Image 6 Bedini/Cole circuit! Image 8 is a different story, this is the SSG icehouse set up. Having 6 strands in my SSG's coils, I took the coil wire return off of the heat sink (collector plate) and took 5 of the individual strands (see Christmas bulbs in my replication 2 page) and soldered them behind the 1N4007 at the collector terminal of the MJL21194's which improved the pressure into the batteries but not necessarily the charging rate. To blow out of the water what i just said, my latest tests with my newest SSG revealed better performance by mounting all six wire strands to the heat sink. Pulsing caps is obviously the answer. In my way you are not restricted to an equal number of transistors used per coil strands. Rather the more branches you create (more transistors in parallel) the more aether radiant energy is being captured, but independently of the strands, sucked up by each transistor mounting plate from the heat sink. Needless to say by using transistor pads and grease you are restricting the aether radiant accumulating process potential. T 1--- 2N3055 upside down inside an aluminum heat sink . Pinout des. : Protruding terminals of base and emitter with the case as the collector. Image 5 (SG) The Steering Cam and Charging Sequence in Image 12 resembles a similar reduction setup as John's illustration below while adding a few more threads to the story. By adding a separate generating coil to your SSG for charging the primary (small) batt. like Shawnee Baughmann did and by switching the generated output by a commutator from the primary source to the gained generating coil in intervals would you then accomplish your free runner. Shawnee charged the primary battery with the generating coil directly, I think, which is the reason she had to change the battery every so often, which is the battery brake-down-result of discharging and charging a battery at the same time. The power is all in the timed switching process. 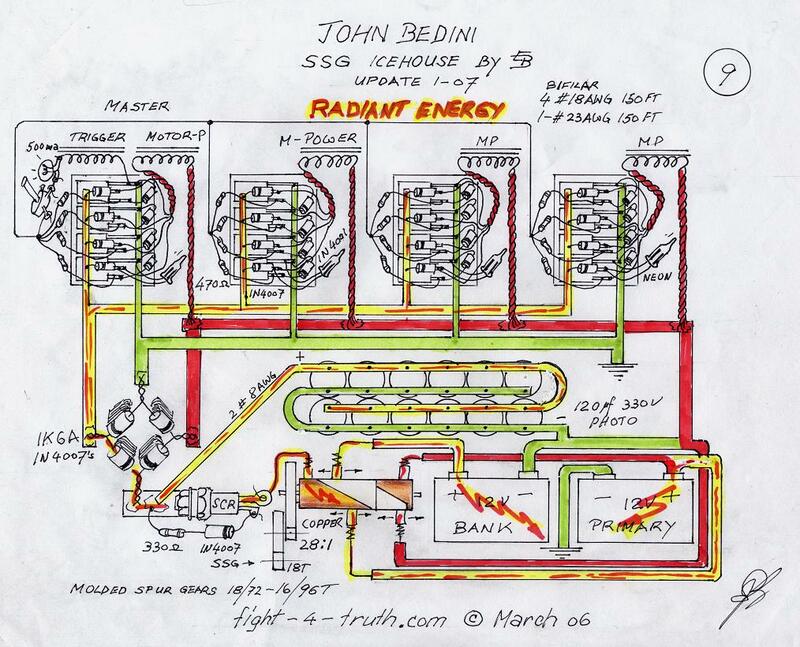 There are two main principles I use of switching the radiant energy the John Bedini way. 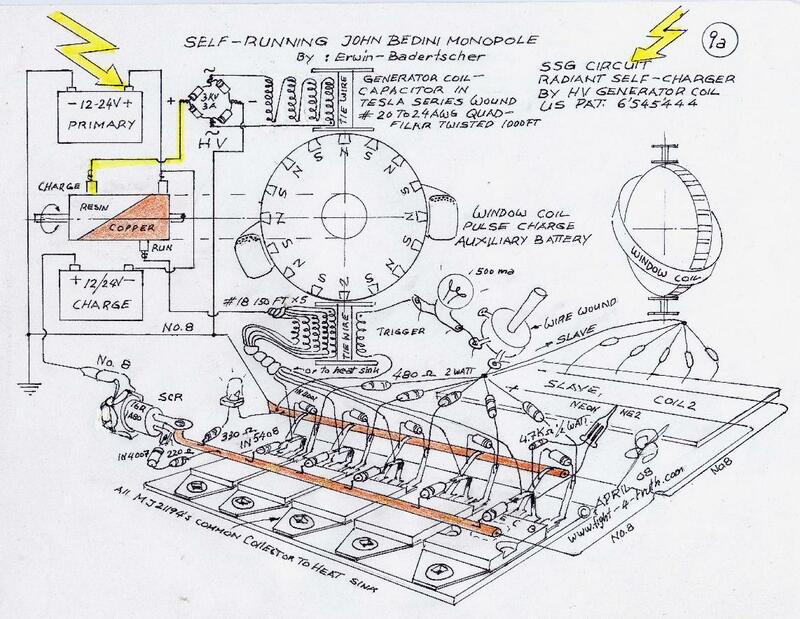 First, the SG/SSG, Icehouse unidirectional circuit or John Bedini Monopole with the School Girl Circuit (SG) Mechanical-Oscillator-Energizer and second, the John Bedini/Ron Cole switching oscillator circuit. 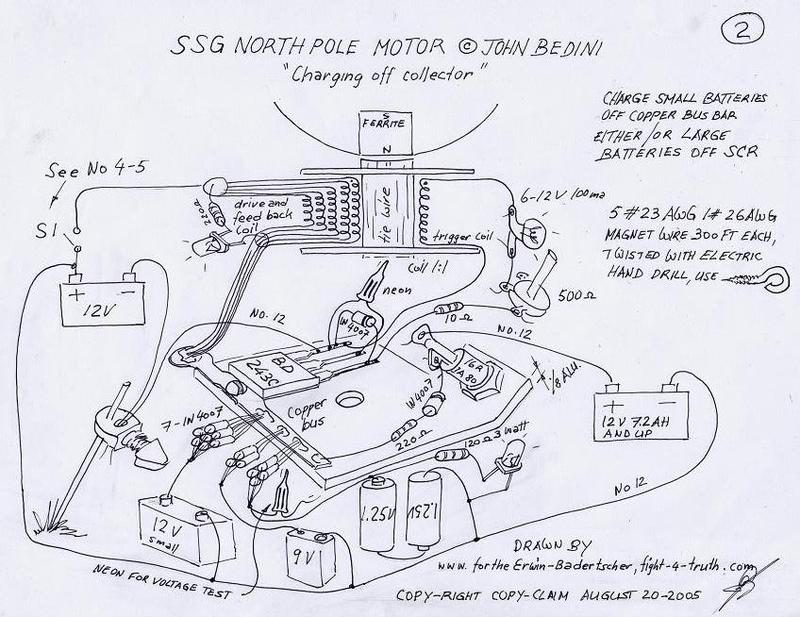 Since my SSG4a/SG4a is a John Bedini/Ron Cole switching oscillator circuit, I should have called it BC4a meaning Bedini/Cole4a. (just to get the facts straight :) The main difference is the transistor arrangement of the first, usually in parallel, meaning for every wire a transistor/multiplying the J. Bedini circuit on the same heat-sink, which is used mainly for charging batteries and driving the rotor. We are capable of setting it up with ordinary 1:1 ratio wound Bedini SG/SSG's, contrary to conventional charging, with very minute current (ampere) but high voltage scalar spikes charging battery banks. The JB/RC circuit is in the other hand a little harder to set up for low current charging even though I used the half circuit in my energizers equally often purposely to get used to it. The window motor is where the full RC circuit will shine. The Self-runner: "The other side of the story"
New to us of course is the handle of the "Bedini SG Interrupter" meaning the interrupting, of a built up magnetic field, by the proper rotating contact switches or commutators with brass brushes, used to abruptly change direction or abruptly releasing the building tension of that magnetically charged field of the generating-coil side before the spinning magnets are collapsing it like in the SG 1:1 coil unidirectional charging side (the HV spikes), therefore shocking the generating-coil system only. Since the voltages of the bigger machines are to high for solid state conductors we use rotating contact switches or timed relays for interrupters creating an energy shock in the generator-coil windings also called "sharp gradient" through the FWBR, thereby producing rectified pulsating scalar HVDC and therewith radiantly pulse/switch-charging the primary battery in the off time with a very high scalar voltage but minute current by using the in-line capacitor. This in turn places the primary battery(s), which runs the machine, in a constant charged mode producing the self runner. For the excess voltage we skip the in-line but are using a parallel cap for capacity towards an effective load. Don't confuse the switch-commutator being a direction changer with the pulse-commutator which is used on the low voltage unidirectional system side for the Ed Gray tube, see BTGRE. For the big power, study "The Bedini-Tesla-Gray Radiant Energy" self running home power set up. Although you can accomplish the big power picture with any of the above mentioned systems by tackling it in different upgrading tasks. Image 6aa Compare Image 6a and 7 with this one. Image 6 (SSG) Image 6aa above, is the base for my drawings # 6a, 6a "update" and 6b. 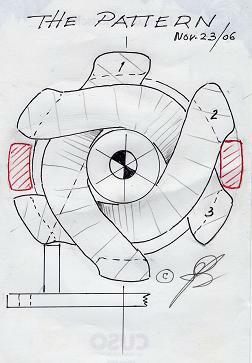 Image 6a (SSG) Can you tell me what the mechanical difference is between these two drawings? If you look at the transistor terminals, you'll see that in the upper drawing, the transistor terminals are not being used, whereas in the update, I took the positive and negative bus bars (wires) instead from the heat sink plates, directly off the transistor collector terminals. Hence drawing the energy from the plates alongside the collector p-type semi conductor, which is sandwiched between two n-type semy conductors of the bipolar transistors, which causes some electrons to jump from the emitter side through the base region into the collector side, causing an increase in base voltage and emitter to collector electron flow, which at the same time is causing positive current flow from collector to emitter, which could be the cause of less positive current heading for the charging side, better scalar energy flow and higher RPM. Cover all your batteries while charging, very important for safety, hitting a battery with too big of a voltage spike might be enough cause to explode it!!! Meaning acid everywhere and possible injury, so better be save than sorry. Switching the "Big Six or Eight"
In continuation of the replication page, I must tell you that I changed a few things around. First I removed all the wires from my 8-coiler, left two coils and removed the others. Squashed a couple of 1/2" copper pipes, didn't have any 3/4 K-copper, which is the stuff the plumbers use for H2O house service lines (heavy wall pipe, match the cross sections of the twisted wire), then I soldered up four transistors according image 8 above, used two #8 wires for bus bars off the transistor terminals, pos. and neg. each, ensuing the two coils in parallel and set everything up. Anyhow I'm getting ahead of myself, the drawing above is the result of my new setup. Another reason for piggy backing a second coil to one plate is having looked at the "Big Boy". Although I think the principal of the "Big Boy" is slave/ motor coil and generator coils. Looking at the book, multiplying the single SSG transistor did not make any sense to me at first, until I mounted all four on the plate and studied the setup. That some transistors have a negative resistance region, has come across clearly, but how to comprehend it, is another thing. Never the less, perhaps picking the energy up through the switching transistors into the bus bar, instead direct off the plate, like I have been doing it, might speed up the whole operation. Realizing that two or more bipolar transistors hooked up in parallel might have an amplification effect like a differential amplifier, which would not really surprise me knowing that John Bedini is a specialist in transistor amplification. Thus I hooked up the four transistors and everything according my feelings (the Lord's help), with the same ohm setting for max. VAC output off the coils (from before with one transistor setup only, since I never managed the wheel to reach the sweet spot) and gave the 12" 8-mag wheel a good spin by hand. When I flicked the switch, the wheel took right off like I gave it a kick and so did the needle of the charging voltmeter. At first the motor drew 4.5 amps then it dropped down to 3.8 then to 3.0 then it settled to the sweet spot at 2.5 amps just-a-hummin.. with a charging reading into the batteries at 0.3amps. Besides my pounding heart of joy, I was getting quite worried, whether my feeble wheel would stand this high RPM with those big magnets, the mags didn't have much gluing surface and my copper strapping was not very tight either... it was really creating wind. I ran it for about an hour, taking some readings at 4.30 in the morning. 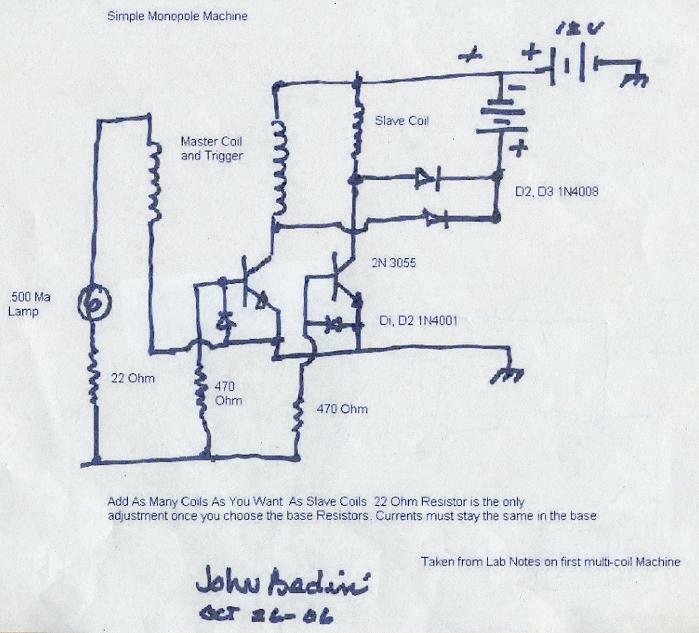 You can see that I am not to far off by this next image 8a, which is the basic (small) proper schematic for this machine (Icehouse) which John Bedini just gave out (Oct. 06). It also testifies of the forgiveness of little mistakes or changes without sacrificing too much output or efficiency of this machines, see my report at Image 3 (SSG) above. Once you work it you get better while you stay at it! The coils look worse as they are, I rebuilt them already, for the wheel ? I will park it permanently. Be careful with this one, you are dealing with kilo volts at the generator and bridge! 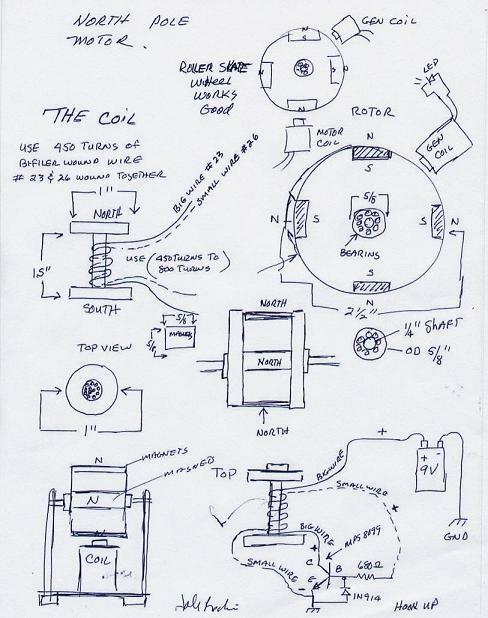 Sitting back pondering about this set-up, it wouldn't surprise me, if John Bedini's big ten-coil-monopole has a similar coil arrangement as above, recalling JB's comment to Marcus of February 2 - 2005, regarding his ten coiler: " the coil arrangement is something that I can not talk about". We all know that John Bedini can't talk about KV. How about four drivers and six radiant energy generator coils in series for pure cold RE kilo volts?? I realize according to JB's note of # 984 /Feb. 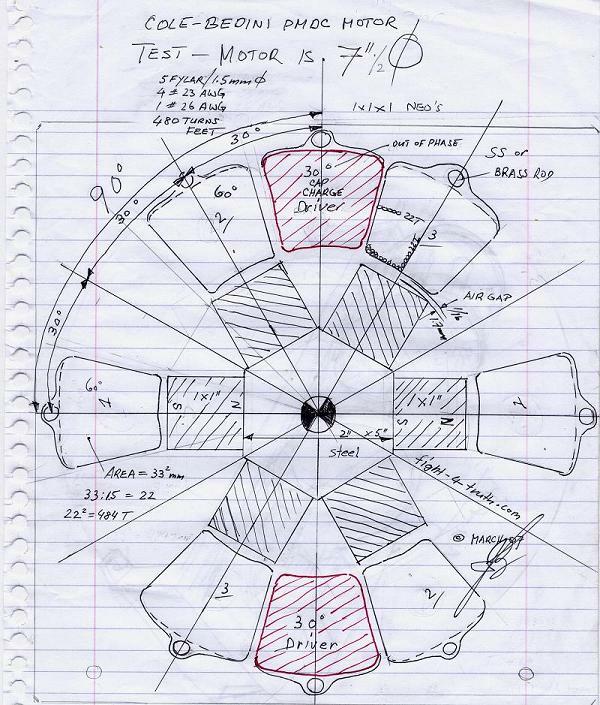 2/05 there is quite a bit more to his ten coiler with its scalar fields then what I might be coming across with. I have no intention to oversimplify an inventors work of brilliance!! Don't be disheartened about # 984, but remember my earlier comment of above: It also testifies of the forgiveness of little mistakes or changes without sacrificing too much output or efficiency of this machines. ----> Use 12 strands twisted of No. 18 gage 300 feet long on your big coils, then you have something!! When I write Tesla series wound (with the Bedini-twist), I am referring to my sketch Image12 INDEX "Enhanced conductors" in my Work Shop page. You will realize in the update below to skip the twist and wind either single or 4-filar wires for the generator coils. Join neg.and pos. buses from slave coils on the SCR side contrary to my drawing, I did it just for my convenience. Multiply the main-bus cross sections by the number of coil buses. W.o. words, a 6-coiler main-bus cross section is 6 times of a #8 bus, which in turn would be the size in front and after the SCR. I built a new SSG circuit according to JB’s newest multi coil schematic, while using a 300 ft 6 - 18AWG and 1 - 23AWG mag wire coil and 14 - 100uf 330V caps. This time I connected the six wires directly to each transistor terminal collector of all 6 - MJL21194’s ( I realize now that this method is used when all individual transistors collector pads are insulated from the heat sinks). When I checked the heat sink with the acustic circuit tester for sound the following occured: No buzzing sound but instead, interestingly and to my delight, the circuit was oscillating solid state, without the rotor moving, with the rheostat cranked up to 230Ohms, charging two 1000CCA batteries a tenths of a volt every 35 seconds for a while. There was quite an audible clicking sound present at the SCR (16RIA80). I left the two batts charge over night from 12.62V to14.26 and noticed the next day that the deep cycle marine driver only dropped two tens of a volt!! Although the circuit had been running by itself, but once I hooked the LED back up and pressed the start button I had no rotation not even the LED lid up, nothing, all nail dead zilch zero!! I have spent hours in finding why I Can't get the MJL21194 transistors to fire properly. This happened to me once before when shortening out the system by reversing the battery terminals by mistake while experimenting carelessly. Not until I exchanged all transistors could I get it running again. Although this new case is entirely different I did unsolder all transistors to check them all for proper Ohm reading again. The familiar transistor firing buzz sound is missing right from the start, while the LED hooked to the coil leads, tells me the firing stroke now though. RPM is barely there, right down to 1.8 Ohm of the resistance values. To struggle with this kind of problems is tough realizing only to well the practical handicap of the present lack of experience. John Bedini has over 30 years experience in this while I can boast of hardly two years, hah…now we just have to buckle up and prove worthy of the gifts presented by John, he didn’t say for no reason, there is no such thing as free electricity. It looks like the problem is in the 0.6V biasing voltage, proper resistance and timing needed to permit current to flow through the collector-emitter channels of the bipolar transistors to give the rotor the kick needed to rev up. I went back to square one experimenting with one transistor and zero caps on this circuit. I will work it until I have it, then I will slowly add the rest to it one by one, like I did previously. I ended up using one of my other rotors and coil. Not until I dumped all resisters I got rotation at 0.5 Ohms on the trigger to the base where I used 6 #23AWG wires to the different transistor bases from the rheostat, I also found better performance by mounting all six wire strands to the heat sink instead to the transister collector terminal. The funny thing is once I had it running at the sweet spot at 66 Ohms, the rotor will now start without any trouble!! Even though I moved up and down the resistance paths I still missed the little operating window. I did try to set proper biasing voltage to the transistors, without success. Magnetic interference with steel on the rotor like the 10x30mm bearings and steel shaft was part of the problem with the other rotor. I should have known to stick to smaller bearings 8x20mm and aluminium or brass shafting. My main problem was the two aluminium bearing supports in close proximity to the rotor. Plastic or wood is the answer. This is just a little example how much can go wrong when you work on a new design. That is why it is important for beginners to duplicate a design exactly, which is already running . I also wash the grease out of my bearings and use same oil as I use on my diesel engines which is a 15-40 multi grade. For superior friction reduction a few added drops of BITRON seams to work well. The possibility of finding it is not very great. I found some near a city along the beach of a lake in the interior of BC. A good place to find it is on mining sites or even on sand banks of lakes which those creeks flow into. A prospector says: "I run a 3.5 ton per hour dry washer and at the end of the day I have several 5 gallon buckets of pure black sand". The desert fox automatic gold panning machine is a method of acquiring black sand by hand in a hurry. An other way is take a 2” neo magnet inside a plastic bag and drag it over sand in different locations until you find some pay dirt. Turn the bag inside out and you have a clean magnet and the magnetic sand inside your bag. Just because you find some black sand does not necessarily indicate magnetic sand. Also the quality of strength in magnetic sand varies greatly. You have good quality sand if it builds up like porcupine quills on the magnet. Black sand is composed of different minerals of black grains and sometimes even white crystal grains of magnetite. The easiest way to separate the weak from the strong magnetic minerals is by building your self a 45 degree acrylic shoot with first and second round 1 x 2" neo magnets (you need them anyway for the generator side) fastened on top of it by aluminum hinges for releasing it through the Plexiglas once you have enough accumulation clinging to the magnets through the glas. You need a 2mm variable slot on the bottom of the hopper and a 10mm variable drop down plain in front of each magnet on the shoot . Mix the black sand or cast iron cuttings with 50/50 epoxy to a thick paste with a puddy knife, before filling the mold/coils, keep in mind that the sand or filings will be settling to the bottom of the core-mold within the epoxy-mix if you don't do it right. Opposite to ferrite, iron or wire core, the black sand-epoxy-mix is a none conductor. The magnetic attraction isn't as strong either, but zero saturation no matter how great the gauss power and speed of the by passing magnet, also instant separation or release of magnetic fields, perhaps even a magnet repellent cick, no eddy currents or hysteresis loss with the black sand. 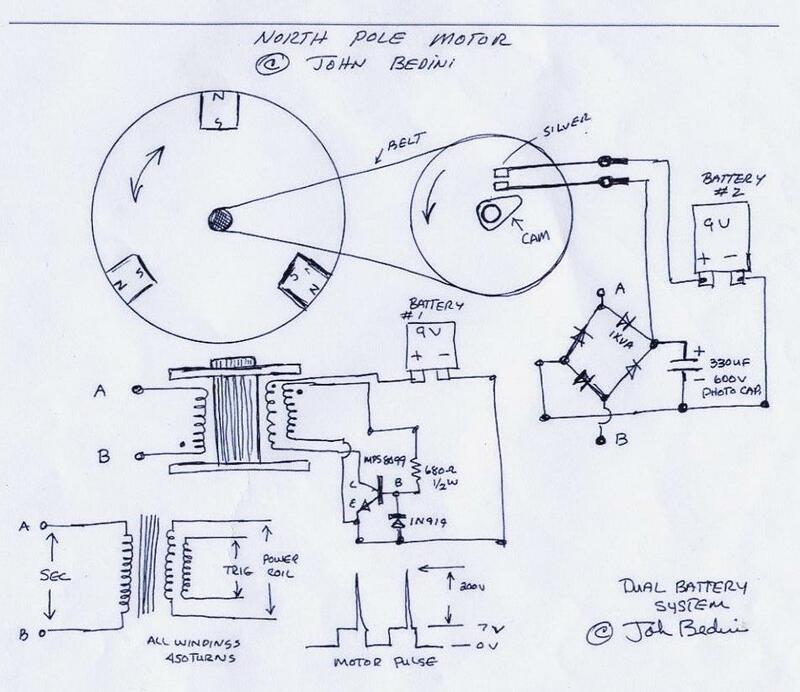 Since we know now from John Bedini how to use a byfiler wound stator coil with trigger wire for timing the transistors to create rotation to drive the wheel/rotor we can implement it in Bill Muller's set up instead of Hall Effect sensor switching where one uses little magnets on the rotor for the stator drivers which is another method used for timing. With 1"x2"neodymium rotor magnets using 2"magnetic sand cores for the stator coils for quick release of the magnetism is a must on all coils to prevent core saturation, no eddy currents or hysteresis losses with the black sand, but instead a sharp magnet repellent kick which is in fact the most important aspect of Bill Muller's machine. Also see Muller below. Then use the, not back EMF, but the collected aether or better radiant potential resulting out of the abrupt tension collapse in those driving coils while rectified through pulsed caps onto the commutator which is oscillating very fast between driving the rotor and super-charging the battery which runs these driving coils. Make sure not to load the caps more than 5 times the battery voltage, which is also the magneto voltage and why John Bedini used 6 coils (approx. 60V) to run a 12V motor for a magneto driver, for safety. Don't drain the photo caps more than to the battery level each time you pulse them into a battery or batt. bank. If you hit a battery with too high of a voltage spike you are liable to blow it up!! Saturation on steel (welding rod) cores of the coils when using neo's is the reason John Bedini used ceramic ferrite magnets hence you can build a Bedini set up more cost efficient. I baught and read "The Free Energy Secrets of Cold Electricity" a book by Peter Lindemann D.Sc. and came to the following understanding: The electro-radiant charge-receiving grids in Edwin Gray's conversion element switching tube is accepting a radiant charge due to a energy shock at the time of the spark in the spark gap at the voltage collapse. Power is raised in Gray's setup from the battery via a cap to 3000 volts DC clipped by a wacuum tube with a impulse duration of less than 50 microseconds through the spark gap, creating explosive radiant electrostatic fields of spatially-distributed voltage which is picked up by the charge receiving grids. In the Monopole motor we do not have 3000 volts, but we have between 150 and 400volt spikes at the time of the field collapse which I assume also results in energy shocks creating explosive radiant electrostatic fields of spatially-distributed voltage all along the rod-core of the coil, hence the reason for mounting the electro-radiant charge-receiving grids right in the center of the Monopole motor. Perhaps I am mistaken in my theorizing, although my feeling or inner voice tells me I am not very far off. I'll build it as soon I can manage some free time. In the mean while others might want to give it a try or get the parts for it since there is more than one way to saddle this horse and I think the sooner anybody does it the better. Rumor has it that Bush is planning to drop the US dollar to 50 cents shortly. If this comes true then look out!!! Puzzled? Is image 14 oversimplified? Don't take my word for it and learn of the wonderful performance of cold electricity, it is not cold as it sounds which promises excitement especially considering that this high voltage you can touch since it does not burn or kill, except from capacitors, which is contrary to what we read about the HV discharge of standard Tesla coils we see on the net. Read of the amazing transformer/converters developed by Nikola Tesla and Edwin Gray, which Peter explains and describes so thoroughly in his book. Image 14a is an example of some parts of my shop experiments. 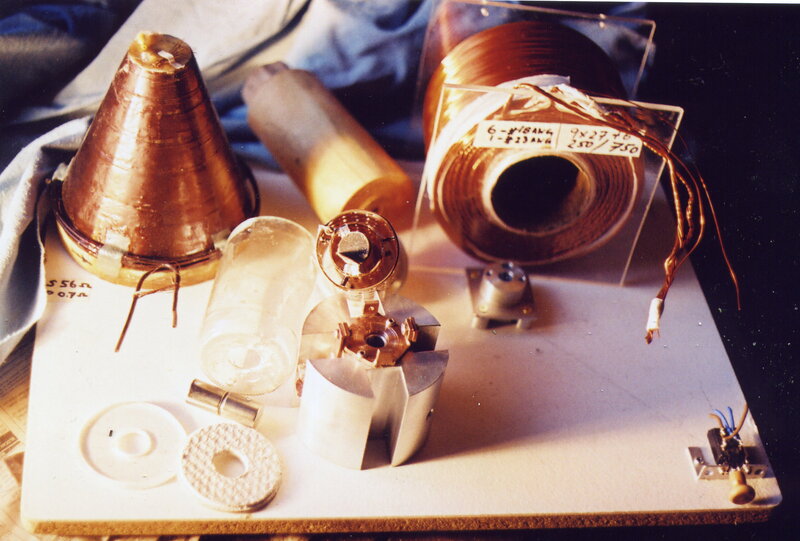 This specific Tesla transformer cone is wound left hand for incoming potential, whereas the gray tube is fitted with a 3/4'' copper tube filled with epoxy/magnetic sand in this case. (The radiant energy is converted from a remote right hand polarized cone as a raised potential of high currant in secondary connected to line down the small end of the cone, towards the base for lowering current through the primary by induction. For safety: The end of the secondary adjacent to the primary being electrically connected and with earth when the transformers are in use or in other words, the fine wire (secondary) is taken from the ground plate up to the middle of the primary loop (heavy wire) where it is connected via switch, continuing up the transformer cone out the top to line and down the top of the other cone to its base where it is connected in the middle of the primary loop continuing to the other ground plate). How do you get KVolts? Check out my 3d replication SSG and have a good look at that long coil. In my workshop pages you'll see how to build your own coil bobbins. Use 1/16" tie or 1.2mm mechanics wire- or 2" magnetic sand-cores and make them about 6" to 10" or 150mm to 250mm long. Fill them with .....Just think "induction spark coil" and go from here---> I posted this remark Nov. 27-07, and mount about 6 of them in series on the magneto end of your window motor shaft stator plate with 7 magnets (if you can keep the 1-1/2 mag.spacing) on the rotor disc and see what you get; Probably about 12KVAC which you have to rectify, pending what you need it for!!! Hei guys...I am just guessing on this one...I think it is one Volt per turn minus some losses or something of that sort..... For kinetic energy, to keep the rpm steady, I'll use a big car or pick- up alu. tire rim, they are heavier as you might think. It is what I am going to do next. This has been an important part of my schedule for a long time!!! The way I see it: I wondered all along what this School Girl exercise is really all about. I might have found the BASE of it now. John Bedini was pushed against the wall, no doubt under order of the global/opec controllers and forced to stay low key, but is like me, he never gives up. 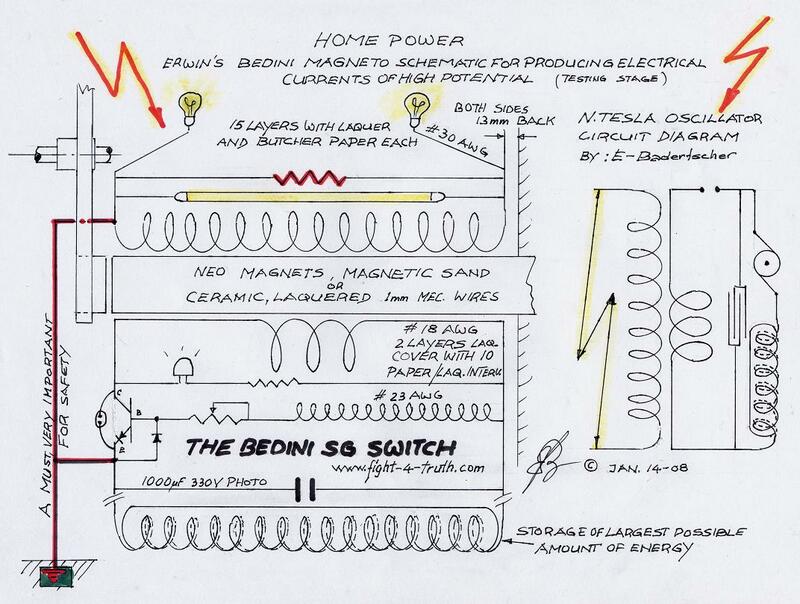 Because of the “Jim Watson incident” (Bedini's 1984 instructed 12KV self runner), he would no longer openly give away his secret(s) (because there is more) how to draw aether energy out of the air. Instead he placed it out in front of every body’s nose for grabs; if you can see it, that is, very clever indeed. Only a God fearing man is capable of such wisdom. On this 24th day of February 2008, I provide you here with a copy confirmation of John Bedini's own words from one of his email (message No. 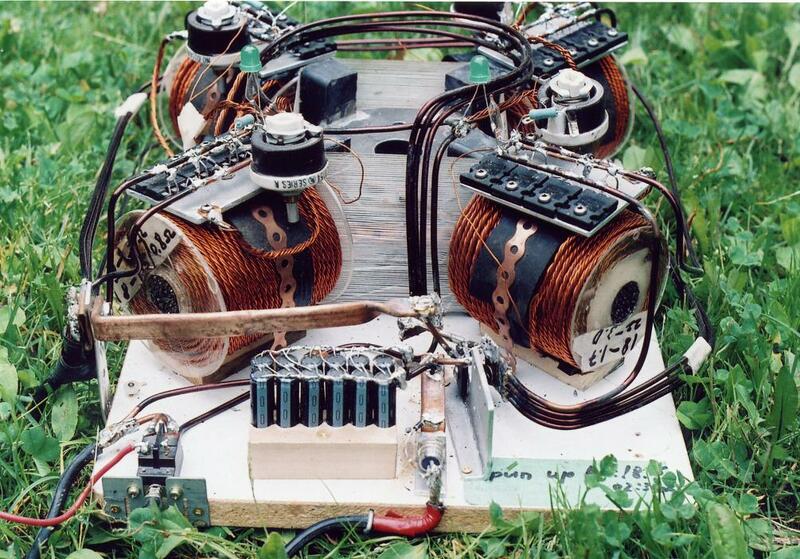 10066) to the Bedini_SG group: “...I on the other hand, remade the 1984 machine, turned it into the monopole energizer. I was told long ago to buy gasoline, stay alive, but the internet has given the chance to everybody with what I knew in this field, soon coming to an end...” This in deed is making me a very happy camper on this God forsaking populated earth proving to you readers that listening to the heart, works if the feith is there!! This reminds me of a young Swiss mountain man, way back as they still fought with cross bows, who promised never to tell any life soul of the battle secret he'd learned. Once at home as he entered the lit up tavern he started talking to the wall oven, while the card playing wine drinking locals in surprise where listening up to the young man who was facing the oven and busy elaborating the detailed battle plan of the enemy he had scouted out. When he was done, he thanked the oven for listening.....he only told the oven and therefore kept his promise. 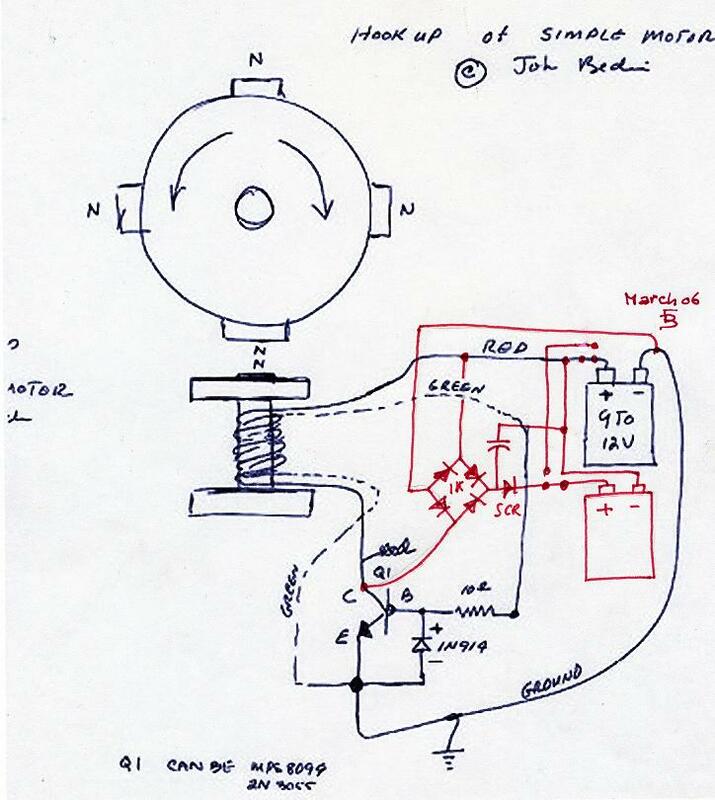 The light suddenly came on when studying some of Nikola Tesla’s high frequency interrupter diagrams, especially his high frequency apparatus with the double flat secondary spiral, gap, cap and short primary coil; Steered by his special adjustable inductive coil which he operated as a mechanical relay switch; certainly very similar to an inductive spark coil, except a few important variations. Brother helped a little too by saying why don’t you use a semiconductor for the interrupter! 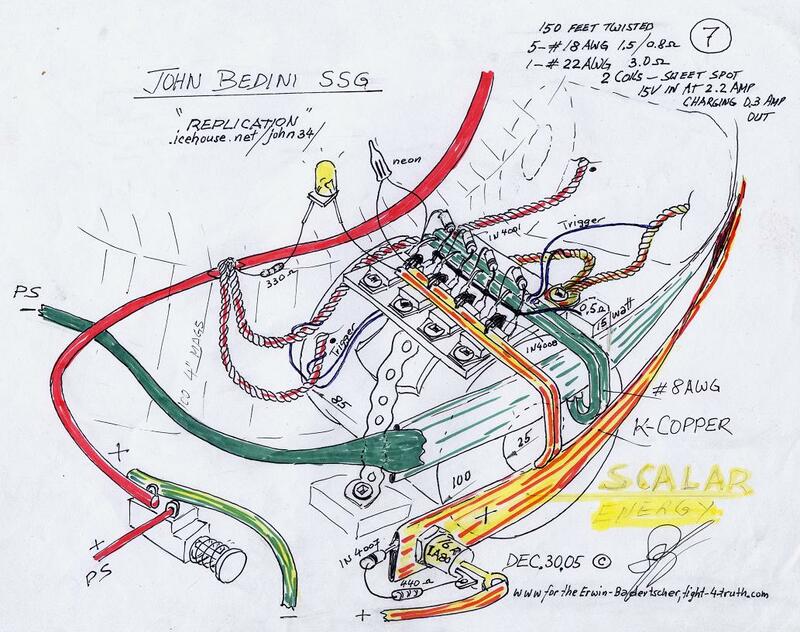 While pondering what switch I should use, it dawned on me, the “John Bedini circuit” of course. Could be the voltage produced by the magneto is a little on the high side although I think we have to probably hook it in parallel, the primary anyway. If the standard bipolar transistors are to much voltage restricted we can always go to the “Low-Mu Twin Power Triode 6080” which is good to 800V. Since the primary circuit in my magneto 7” coil is low voltage fed by the neo magnet a MJL21194 might just do the trick. Two layers at 296 turns. (178/1.2mmx2= 296) =3.4V at 122Hz on test bead with driver of 4 ceramic mags at 332Hz without the capacitor working. See My Workshop update index #37. I am proof that I can make things work even though I do not understand the theory perfectly. I work a lot by a straight inner feeling, which is the Saviors help, and get things done. Out of lack of concentration or understanding or over eagerness sometimes I fail. With the approaching magnet, the primary coil is magnetically charged (Magneto); at the same time the adjustable capacitor is being charged with this low voltage halve wave and positive sine pulse, which is not being used in the SG configuration. This charge could be enhanced by a standby coil specially wound with an adjustable ferrite core (Tesla) for maximum capacity and adjustable frequency. 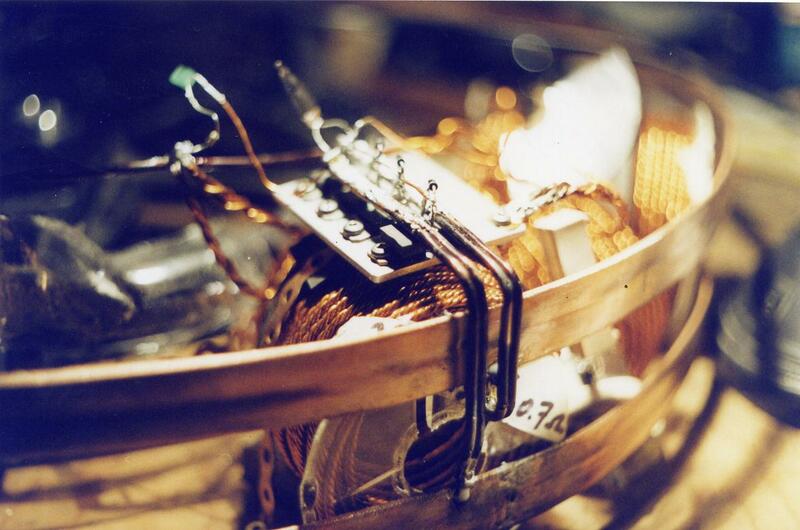 Specially wound coil meaning bifilar wound with the two wires connected in series. I see myself changing the construction of the system a number of ways if I'm not happy with it. I know now that comparatively few turns of thick wire and the rapidity of vibration of the primary currents give the required pressure in the secondary circuit without the need of fine wire in the secondary coil. Even if I have to use the magneto as an independent power source and use an adjustable electromagnetic coil of greatly increased capacity for the interrupter to get the speed. According to Tesla, a circuit with a large capacity behaves as a slack spring, whereas one with a small capacity acts as a stiff spring vibrating more vigorously, which would be frequencies I probably would not be able to measure with my present instruments. Study Nikola Tesla's "Lecture before the New York Academy of Science - April, 1897". Then you will become to realize too, Tesla as a math wizard and mechanical engineer among many other gifts, determined all physical constants by math, his principles being thus tricky, which is the reason John Bedini tried to keep it right down to earth for us; I'll exhaust all his possibilities first before trying to venture into Tesla's ball park again even though it was one of his patents that gave me the most important clue. Nikola Tesla exhausted his coils and capacitors for insulating purposes in a pressure tank while melting the beeswax and paraffin mixture with steam permeating the mix into the smallest spaces to force out all gas bubbles, which was the reason his equipment was capable to stand these high electrical pressures and extremely rapid potentials. As I can see, there is quite a bit more to get to the higher frequency currents, although the present object is to get the independent dynamo power source to begin with, which is the purpose of this paragraph, meaning that a HV of say 3-5KV, would do just fine. The KHz frequency created by the shaft RPM and seven magnets off the secondary, I should be able to measure at full rpm of the magneto. I measured my SSG4, on my Replication II page, running at 674 Hz (coil output) my meter maxes out at 40KHz. If you kept track of my writings about the Radiant Monopole motor, “Image 14”, you, the “old guard” would note though, that I am getting closer all the time. Yea Roamer… I can just about see you smiling…Sorry I'm so slow, but thanks a lot for you and your friends help! OK folks, here is some more food for thought and incentive to get with it and build the magneto energizer. Most of you people are much faster comprehending then I am, thus you have it done in no time! I could have waited and let you guess what I’m doing until I have it all working, but this way you’ll have more encouragement and chances to outdo me. You can’t go wrong here you always wanted a self runner anyway! By the copper as soon as you can, because soon you won't be able to get any!! 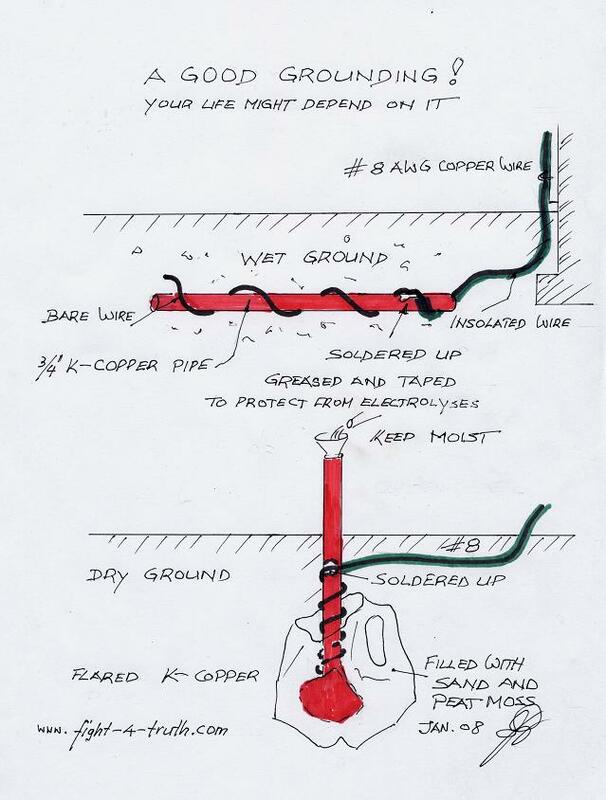 If you can't find a copper plate, then "K"-copper tubing you can get from a plumber. Any ground rod in dry ground isn't much good. You need to see to it for wet ground. Apply conductive grease to the copper to keep electrolyses away. Image 13 This is the famous John Bedini Free Energy Generator. Thank you John Bedini! John Bedini writes that if built and adjusted correctly this unit should supply energy for whatever you need. So if you are impatient listening to "poky" here, then build it exactly to JB's instructions in the front pages of his FEG book. 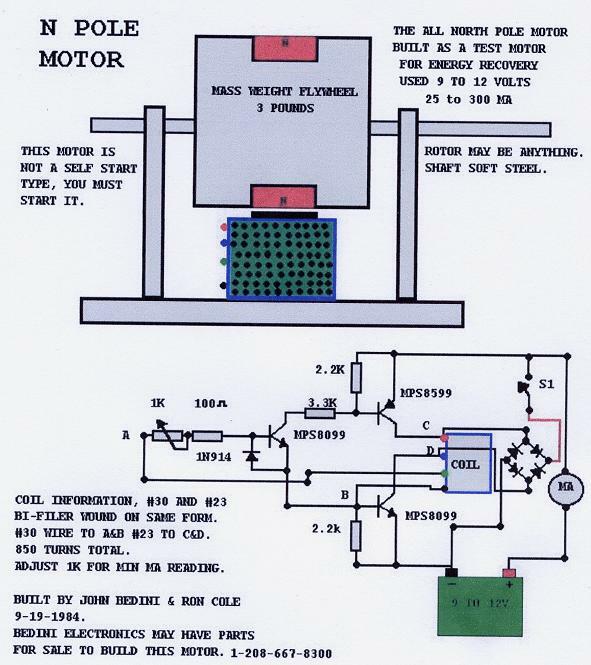 The torquy and efficient window motor with SSG type Bedini/Cole switching, Image 6a, or JB's lab notes, is the idea instead of the standard 12V PM motor above. Having built the SSG B/C it will be a breeze for you now to construct a window motor (not car window see image 15) and extending the shaft as shown above, the motor will run itself fed by the battery which recharges itself, if you setup the commutator right that is, like John said, you have to do a little tinkering to get it to work!! 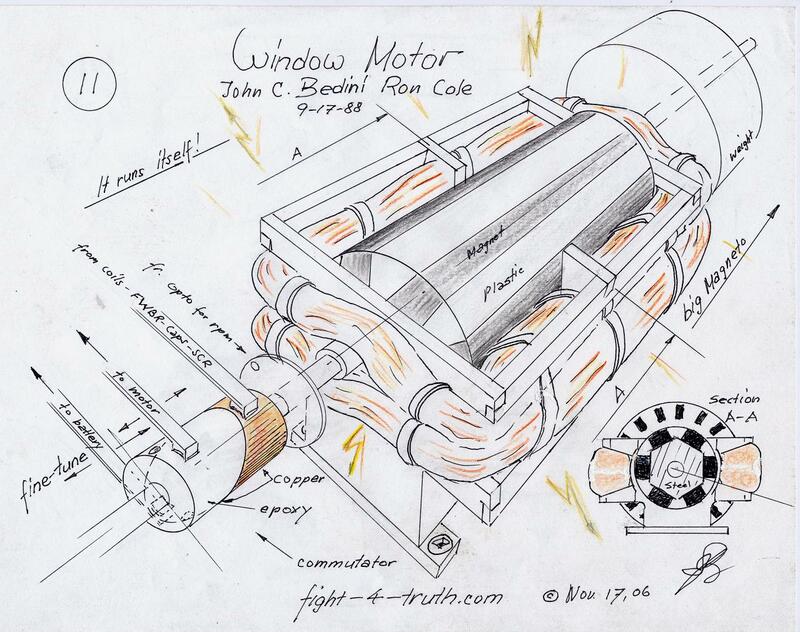 The advantage of the window motor producing its own scalar-power is resulting in full usable output of the magneto, generator or Hugh Piggott's alternator. Use SS or brass shaft, 6x6" long plastic rotor and 6 1x1x6" long or better yet 2" super pole neo magnets since we have no iron core. The impedance of this motor is very low start with 400 feet depending on your battery size 1 to 4 #18 1 # 23awg magnet wire per window coil or skip the smaler wire and use hall trigger. Remember more windings = more RPM/Volts stronger spikes, less primary draw. More wires twisted as one wire "Lize", brings down the impedance! Study Image 12 which is for battery charging though, a slightly different principle and construct a controller with brushes copper and epoxy (commutator) switching from the battery to motor and energizer/window-motor-coil to battery/capacitor at 50% (adjustable)on/off cycles or direct off the window coils back EMF/radiant energy mix of the widow motor which process has to be fast enough to make it work, like the commutator above or image 14 and 15 below. I might confuse you here some what, with other words, there is more then one way to make this work. Very effective, no components to burn out, no sparking, it will handle any amount of current you'll ever need! If you are interested, Rick Friedrich at one time sold John Bedini's booklet on this generator for about 20.- US-Dollars. It is worth every cent of it, which is apparently now included in John's book. On the Bedini energizer side for preventing locking up (Bill Muller), use an odd number (5 magnets and six coils) of, this time, neodymium magnets while winding an even number of stator coils in series with 20AWG magnet wire at 250 turns each while like Bill Muller using 2" magnetic sand cores for extra big voltage spikes and magnet repellent kick, with a stainless steel coil mounting screw, or cast iron cuttings (machine shop) as a second and lesser option although in our case we probably can get away with it not having to worry to much about core saturation** no doubt but having to sacrifice quality on the voltage spikes. 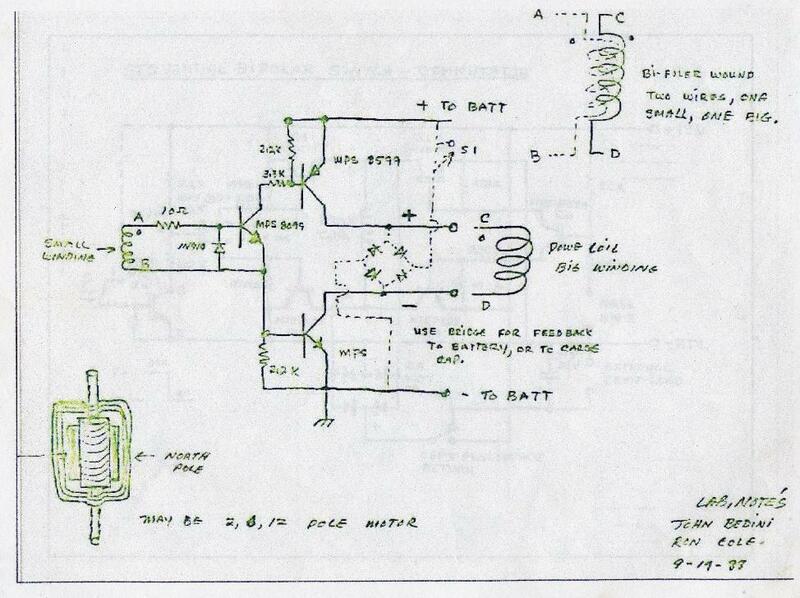 According to Bill he used 3mm magnetic wire on his coils because of the high current (32V-7.5A =240V) with a limited amount of windings using three coils for driving the rotor by means of big mosfets etc. timed with small magnets on the rotor of his machine which I witnessed myself as he demonstrated it to me and my brother, he might have used thinner wire on the stator coils to drive his rotor. I recall clearly that his approx. 26" rotor didn't turn all that fast 2500rpm if I'm not mistaken, while he demonstrated high current and high torque on a third of his coils installed, brother bear couldn't slow it down with one of Bill's rags in his hand. Bill claimed a 1:2 gain at 400shaft hp with 30 stator coils. See Bedini/Muller-Combination. Make yourself a core mold with grooves for the bobbin sides with a greased up ss-screw in the center of it and mix the black sand/cast iron cuttings with 50/50 epoxy to a thick paste before filling the mold, keep in mind that the sand or filings will be settling to the bottom of the core-mold within the epoxy-mix if you don't do it right. Opposite to ferrite, iron or wire core, the black sand-epoxy-mix is a none conductor. The magnetic attraction isn't as strong either which is why you must widen the diameter of the core, but zero saturation no matter how great the gauss power and speed of the by passing magnet, also instant separation, perhaps even a magnet repellent cick, which is the reason why Bill Muller used it. Forget the twist in the generator coil and see my note in the last paragraph of INDEX NO. 38 "Enhanced conductors" in my Work Shop pages. You could call the above a one wire or one way system. It is similar to Tesla's one wire power transfer. Patent No. 593'138 Nov.2, 1897 or method of utilizing radiant energy. Patent NO. 685'958, Nov. 5, 1901. It operates on the positive one wire system. Starting up with magneto power through the six windings in series as pulsating medium HVAC to the FWBR where it changes to rectified HVDC loading the capacitor, with the negative line to ground (open circuit) then the first sharp gradient into scalar power occurs in Bedini's "Watson Machine" due to the abrupt pulsating charge and discharge interruption of the magnetically charged capacitor by the rotary DC switch. The now multiplied pulsating HVDC positive then continuing into the Ed Gray tube meting at the spark gap with the12V battery positive of unidirectional pulsations violently splitting the positive explosively into scalar power. 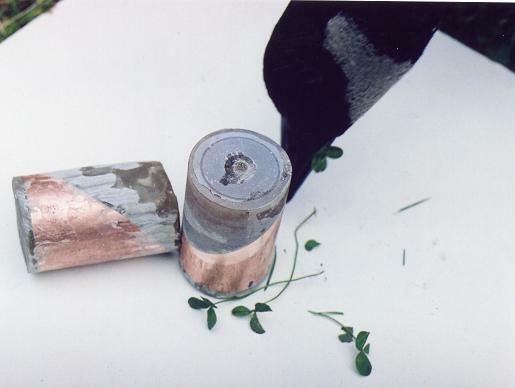 The low voltage is timed through the second pulser at 120° intervals with the other brushes staggered touching the narrow copper insert-contacts with an impulse duration of less than 50 microseconds through the spark gap causing a shock wave of exploding radiant energy transformation onto the copper grids in a 90° fashion from the 1/2" copper rod, to a powerful conclusion on the one wire scalar HVDC positive system as the main load and ending up with the remainder of positive cold electricity in the battery. Once the battery/s are charged up we bypass the in-line cap by voltage regulator, energizing a heat coil or other load to ground. The impulse duration and frequency could be changed by different numbers and size inserts using tapered or abruptly (square) stepped permanent bars, which is more abrupt than a round contact. The more contact-bars per turn, narrow, clean straight cut of the bars for abruptness, the shorter the impulse duration per microsecond, the better. The more bars per turn the higher the frequency the more radiant energy gain. 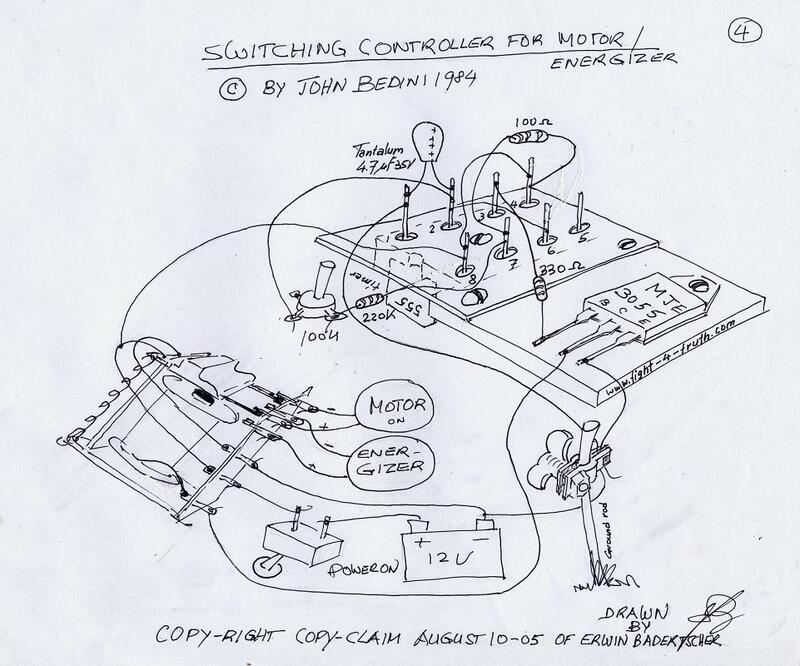 John Bedini modified an auto distributer off of a six-cylinder engine which would have given him three impulses per turn for one coil at every 120 degrees with the other brushes staggered accordingly. The fast diode assures one way pulses matched against the leaking HVDC spikes through the carbon resistor from the conversion tube side. As soon I have have some info to share on the small Tesla compressor I'll post it. It is also an interesting little project! 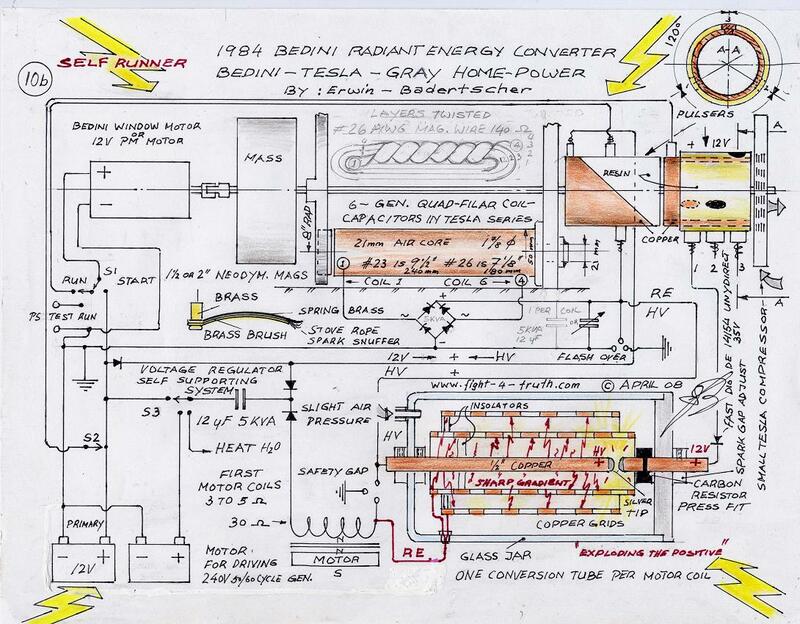 In his patent of June 17, 1986, Edwin Gray called his electro radiant tube "An electrical conversion element". This whole conversion process goes right back to Nikola Tesla and his radiant electricity research in 1890 after pinpointing the cause of death concerning men closing the switch while applying a high voltage DC generator (in those days) to wire lines in large regional power systems, where voltages were excessive, which caused a sharp gradient and resulting shock wave with explosive and lethal effects thereof. Tesla found the same effect in his explosive capacitor discharges that sounded like gun-shots of more extra great power than electrical sparks. Although the two applications are completely different, they both generate the very same effects. Tesla found the electrostatic concentration to be amplified to a much greater pressure as a result than any voltage which the dynamo could ever produce. He discovered the effect was related to time, a single unidirectional impulse time. The continuous high voltage dynamo pressure to the circuit charge-rapid-discharge obtained the desired rare shocking field effect. He discovered that these radiant forces traveled like light-like and uncommonly strong rays. During Tesla's shocking-wave-tests radiant power came more and more apparent, this is radiant electricity, which could be called a gaseous manifestation of electrostatic force, he says. Around 9 years old as I walked home from the woods during an electrical storm, I witnessed a lightning bolt striking the ground 10 to15 feet between me and a tree. The bolt was bright yellow and about one meter in width, it struck the grassy ground with such eerie, air-cutting, smashing force, I found myself breathless for an instant and a strong sulfur smell filled the air as a result in this close call. It was the same smell the matches produces when I lit the fires in my stone oven in the bush. The incident left me somewhat baffled and it is as clear in my mind today, as it had happened yesterday. The old European proverb "Eichen sollst do weichen aber Buchen sollst do suchen" didn't apply there, because it happened to be a tall pear tree which was on the other side of the thunder bolt :). (stay clear from oak trees but find beech trees for shelter, in an electrical storm). Besides the fact that oak trees have a coarse linear/radial and moist bark and the beech tress have a very smooth compressed dry bark, there are most likely other factors involved which today's society knows little about. Just off-the-cuff one could be positive and the other negative to the existing high tension in the cloud to ground circuits relative to the earth magnetic field, to which Nathan Stubblefield might have had the answer. I updated the commutator mechanics with simplicity in mind for the tinkerers who don't have to much equipment. PVC is easy to work with. For more stability on the brush holders drill holes and glue them in, instead on the top of the coupling like the drawing is suggesting. 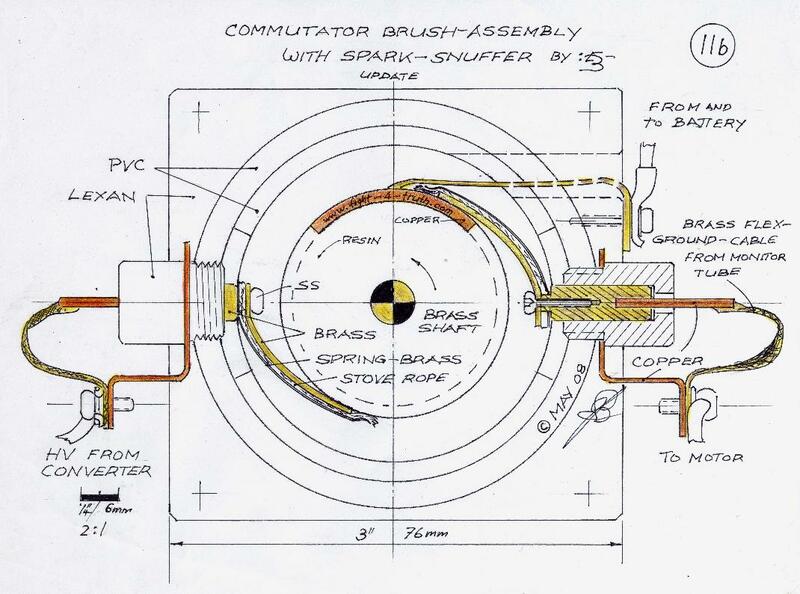 For how to construct the commutator, look in my Work Shop page under INDEX 2a Commutator Casting. If you are not good in reading drawings here is the sequence: Prep. shaft in lathe with bearing and commutator in place with bushing and snap ring groove, unless you want to place a thread with washer and nut but then you have to add a washer in between the bushing and commutator. Drill hole in the plywood, machine the bearing press fit, clean up surface flush with bearing for the PVC end base... you can do all this on a drill press if you are handy... and screw it onto the board with 4 screws, machine 2"PVC pipe to length drill all the necessary holes and glue it onto the end base make sure it is lining up with the commutator. then glue the prepared battery brush holder coupling in place. Drill hole and cut a plug out of solid PVC with hole saw to create bushing for brush. Bore for brush must have close tolerance and a groove for a pin to slide up and down on the brass brush or other means, the assembly can't be sloppy. Where you see the arrow above the words "adjustable sleeves", there are two gaps, I drew the set screw and holder onto the wrong side in my hurry, it should be on the right side of the brush holder, also make those gaps wider for a starter until you have the permanent setting. For easier spring tension settings setup the two opposing brushes in a horizontal position. What you have left over then are two brush holders to build with the couplings with Allan set screws to slide and adjust until you have the battery thinking it is not doing any work (charging itself) and thus... you have the self runner working tickedy boo!!! Update: "Image 15", I found it easier to just glue the inner PVC into the bore of a chunk of Lexan, on this updated pulser and mount this base onto the stator panel with the screws on the outside of the assembly. No need for springs since the brushes are quite springy. To get more inside room I suggest to use a 1" copper coupling in place of the 1-1/4, for the commutator, unless you are planning to use a second bigger pulser on the same shaft for the EG tube, then go bigger on the PVC. For safety make sure that the primary battery is not hit by to much current of your energizer, to remedy, use an in line capacitor on the positive feed as a current buffer, the pulsed DC high voltage will bypass which is what you want. It will be the current (Ampere) not the pressure (Voltage) which might blow up the battery, hence make sure you have a good cover on it!! When you build your first window motor use a steel or brass shaft through an armature core of 2" hexagon steel 5" long (unless you have an extra long 7/16 and 1/2" drill bit) and 1x1x1 neo magnets (two 1" cubes have more lifting capacity then one 1x1x2" cube) with three coils complete using 2 - UGN3020T's Hall preferable for the switching. The perm. setting of the N and S Hall are at 180 º opposing each other, whereas the three magnets on the little disc are on a 120º spacing, giving you a total maximum "off" period of 90º or 25%. 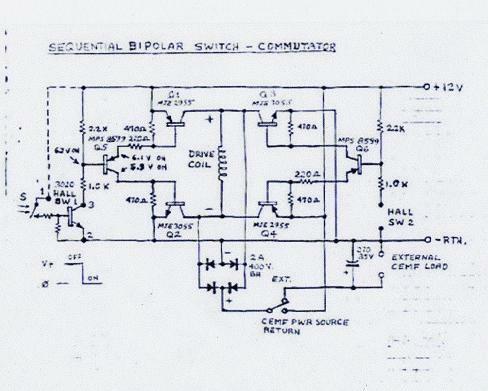 Hence it is evident that you have to switch both the N and the S. Use the Cole Bipolar schematic for now with two power silicone transistor MJE3055, NPN, two MJE2955T, PNP, 10A, 60V and two MPS8599 amplifier transistors (PNP's). This is enough info to make it work. 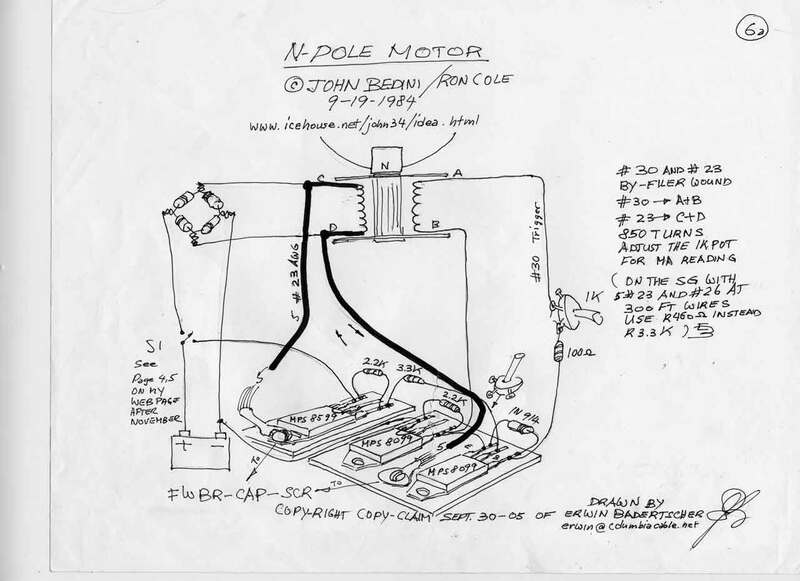 Now you have the full Cole-Bedini Motor schematic and more of John's drawings right here. Wind your first three coils bi- or quad-filer #18/23AWG or quint-filer #23AWG, image 16, that way you are not committed to hall switching. Twisted wire gives you more voltage also the coils end up deeper...whoa Betsy...!!!! Update Oct. 21-08----->Do not use the twisted wire. The result of the twisted wire is less voltage out. Hold the wires of the coil together with lacquer and cloth or super glue in spots (it has to be slightly flexible) as one unit before you take it out of the jig (wax the jig). Also while the coil is still sitting in the jig set up a jig for a plastic epoxy bearing (drinking straw slide fit)at the N and S end, which will take a brass or SS rod threaded with a shoulder both sides on the outside edge parallel to the shaft in the center of the coil thickness to secure the coils in cylinder form and equal spacing. Make sure you keep an eye on the written text, all you need to know to make it work, you'll find right here in my pages. If you think not, then buy John's book with the latest window motor updates! Sorry, there is no window motor updates in his book. I just received the book in the beginning of August 07! The most interesting pages to me are the off whites of the magneto or free energy generator. Next are pages 46 to 48 about the Advanced Bedini Monopole/Solid State Energizer and Earth Battery Hookup. If it is to far fetched for you then just pick it up on a later date... perhaps when you buy Rick's kit for the back end, then it will "click-click" for you!!!!!.. at http://rpmgt.org/order.html. 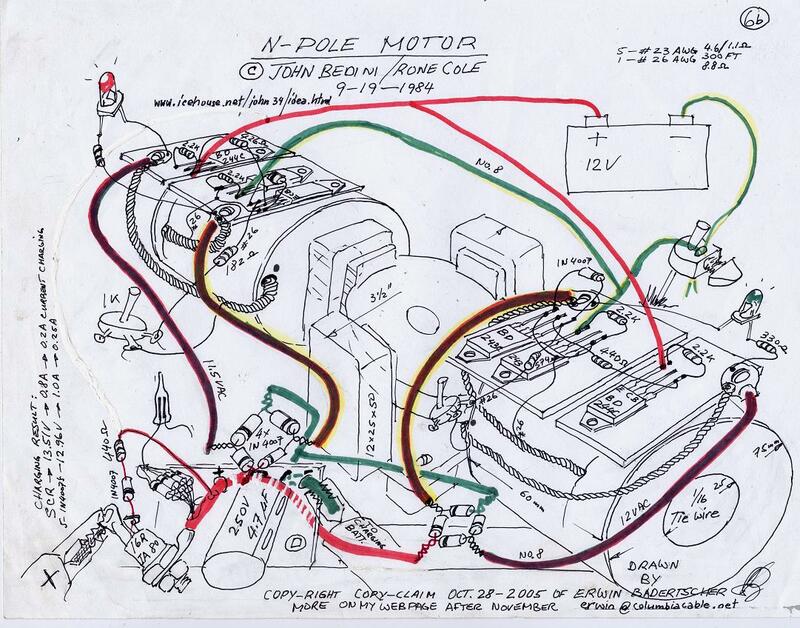 Also study JB's website: http://www.icehouse.net/john34/ The motor won't likely run itself unless you construct it as show on this pages. For the last 7 years no one has publicly shown Bedini replication success for beginners (with God's help) as I have within this two last years. What is a taught theory or picture worth if you can't see the practical application for building it to make it work, apropos helping your neighbor. No sooner I had added drawing #11, which is image 15, to this page, John Bedini came out with his self runner demo and motor specifics. I am sure John Bedini didn't publicize his window motor Dada so it might be lost to some selfish controller. Here it is. Don't get nervous waiting for the file. It'll take at least 3 min. for the 16 drawings to appear on your screen! Image 15 b This is John Bedini's schematic which I took the above drawing from. Work it until you have it. I can guarantee you that it works. I am not going to prove anything by video. John did it, which should be good enough for anybody and enough incentive to get going on it and build your own. Don't forget the big wheel for kinetic energy to give the motor momentum, the bigger the radius of it the better. If you can install a pulley to pull start the motor (rob one out of an old lawn mower or read "Cone start" under start up), to pressure up that cap quickly, you'll have instant Volt-torque for RPM acceleration. John Bedini demonstrated the motor with one coil to us through a video by just rotating the rotor by hand and said: "I would really like to have a mass, like the other, but I don't have it". He is talking about a fly wheel for kinetic energy. Make sure the magnetic poles are N and S in line, the N-pole is switched on the N-pole side of the "A" field of the coil while the S-pole is also switched on the opposite "A" side of the same coil in intervals. It is entirely possible that the coils which are setup "in phase" are in charging mode on one capacitor while a second coil marked in red "out of phase" is running the motor from another capacitor!!! Perhaps the second cap could be pressured up and then dumped into the first cap. I am far from an E. engineer, but flexible thinking helps :). Through trial and error I will get to where I am headed, so be patient with me when you see blunders I am making. I'll fix them as I see them. The commutator in image 14 and15 above, which is my design, is a mechanical switch, it works with HV if you can keep the brushes from burning up at high voltage. 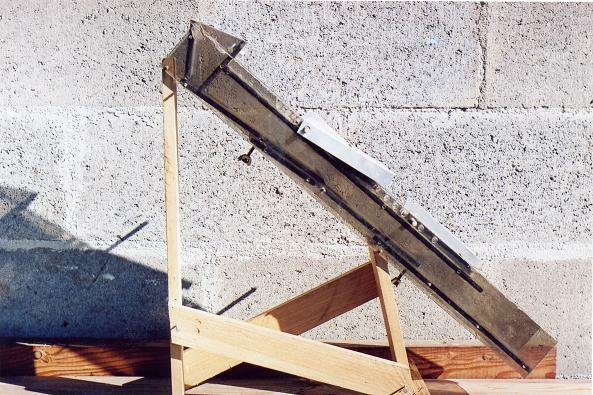 To quench the sparking off of the segments use a washer or strip of incombustible asbestos with the cyl. or long brushes. 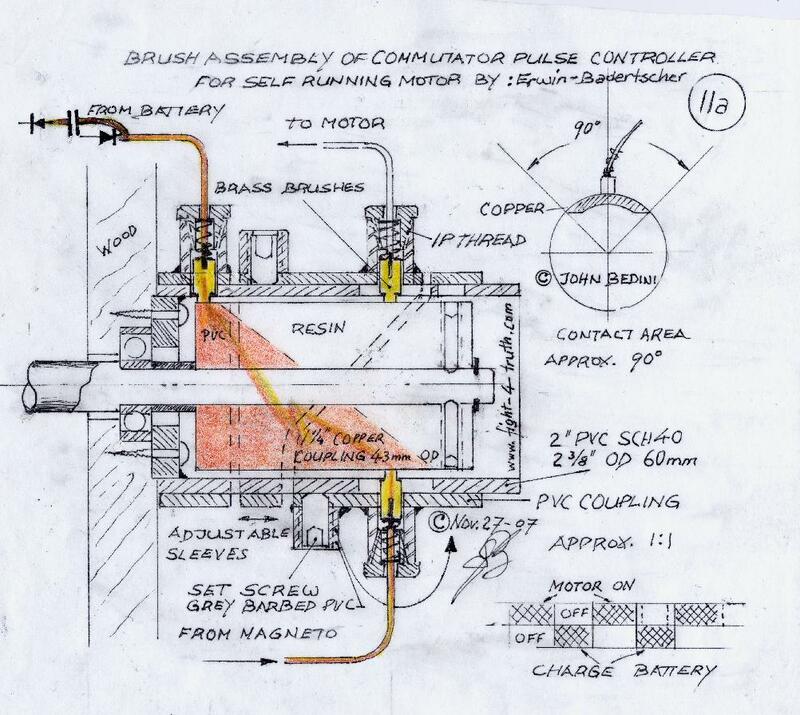 The SSG or window motor is just a mechanical way of triggering this radiant energy and the copper wire is the collector of it, and it closes the loop to charge the battery. I built the commutator or better on-off-switch in a similar way as I pour my little rotors/spools. See the write up under "2a Commutator" in my work shop. I used two sizes of copper pipe. One I cut in an angle clear across, the other bigger one I silver soldered the inside "ID" and machined it out to the same OD as the commutator and cut it into segments for the brushes. Be aware that this Motor can be setup and switched in a number of different ways. Also be aware that we have been riped off by the elite cartel right to the very basics in how to run a generator. If a certain generator is set up with "two more coils" 90º apart with a capacitor the generator can be operated as a motor/generator running itself after it has been started with a pull cord!!! Remember I titled my website "for the fight-4-truth"! During world war two, two GI's wandered into a little town in Germany. The Two Gi's were shown a BOSH generator that was modified; they crated it up and sent it home. The device used a pull cord to start it, once it was started it ran itself at 5000 rpm's and lit 300 watts worth of lights, any more it would quit. The secrete to the machine was switching and a special capacitor made from waxed butcher paper. Without the capacitor it could not transform the spike from the motor. It was called the Lockridge device, he built this with Delco Generators that he took apart and modified by adding "Two more coils" 90 degrees apart".. The switching, When the machine quit running the brushes failed, people would go to the auto parts store and buy brushes install them and the machine would not work. Lockridge did not tell them that he sanded the brushes smaller then the commutator segments, so the people sold them for the copper. Lockridge was hunted down by the department of energy and they could not get him for anything, so they worked on his wife who became the town H..... , Lockridge went nuts and poured gasoline on himself and lit the match. The machine was never seen again. I know about this machine because of a good friend who talked to people that owned them. This was a real machine that ran itself closed looped, the Cole/Bedini motor can do the same thing without the brushes. The switching must be right along with the generated output. We have all the best magnets today to do this, he says. 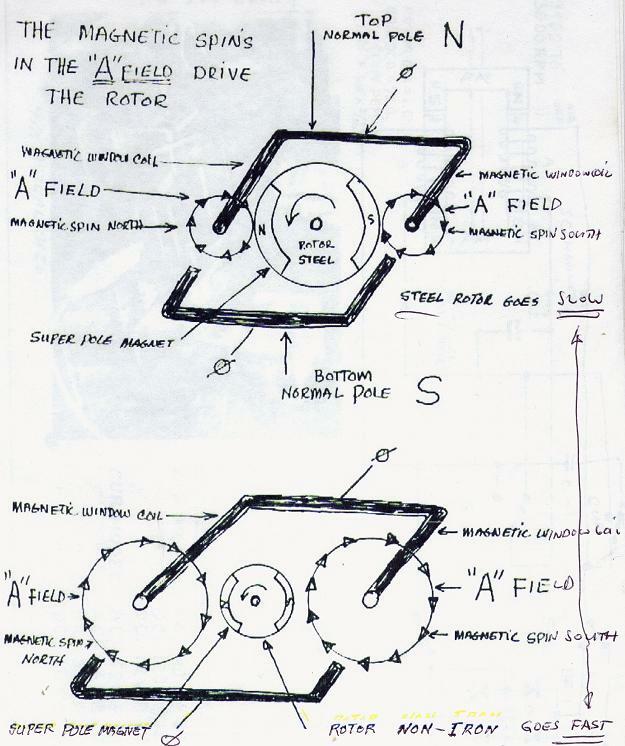 Image 16a is a copy of a C/B Permanent Magnet Direct Current (window) Motor sketch out of my shop note book. This is the motor I am using to drive the high pressure DC-magneto to run my high-impulse Motor-Dynamos and spark gap discharges for the Electro Radiant Transceivers, the Tesla-Cone, the Grey tube or both. While you design your own jig, use a wood dowel the whole length in the center of the jig with an outside diameter by adding 1/8th to the OD of the magnet rotor which would give you the inner radius of the coils . Add a small wood plug at the end of the big dowel for clearance of the coils over the rotor shaft. Keep in mind not to glue, but to bolt down the top two wood plates in order to remove the wound coils after! When you install the coils build a frame around the coils/motor for tying them to it for rigidness. Already in the early 1890's, Tesla, the AC generation inventor turned his back on AC, since he discovered that a radiant electrical DC power with impulse duration of less than 100 microseconds could not be sensed and would be without physiological harm for power broadcasts but would penetrate through all matter. The apparatus Tesla employed and method obtaining the high potentials/high frequency and high currents where mainly two or three motor generators. The main apparatus was a permanent magnet AC motor with an increased DC output to which he added more motor dynamos to raise the frequency and pressure even higher. Radiant aether energy is based on very high DC "frequency", meaning a series of extremly rapid unidirectional impulses per second, which Nikola Tesla produced with a group of his developed DC motor-dynamos with two commutators, see Image 18 below. 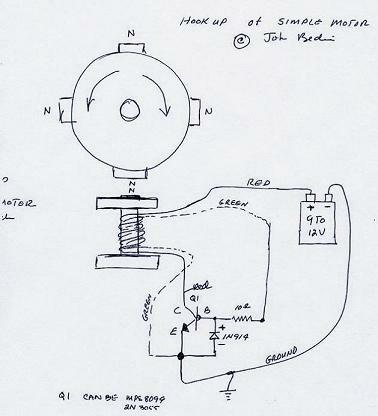 By the way, his first AC dynamo he designed had two armature windings at 90 º opposed and slip rings on the same shaft at each side of the armature. 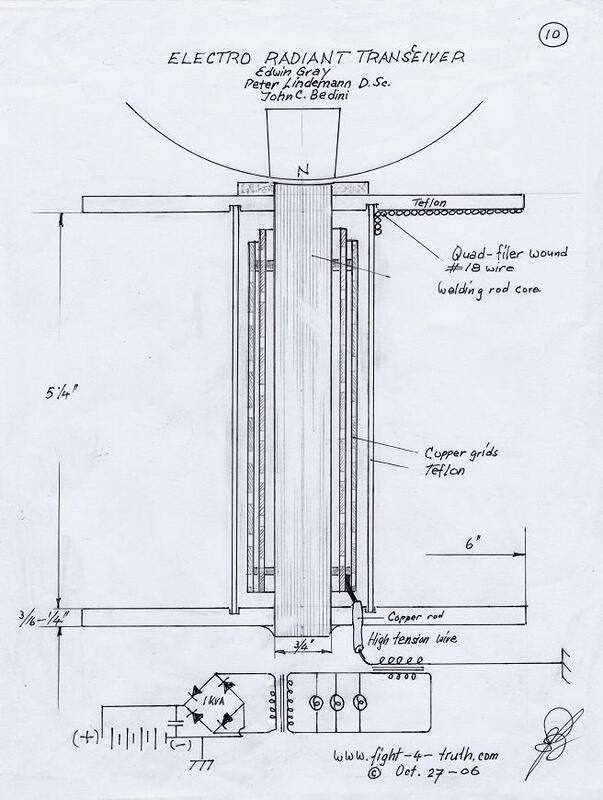 The motor dynamo was designed for two commutators or slip rings with one winding for the motor input/acton while the other winding on the same armature was the dynamo output in the same rotation. Does this sound familiar? If you think about this for a second, you can add up very quickly why those motor-generators are not heard of to this day!!! 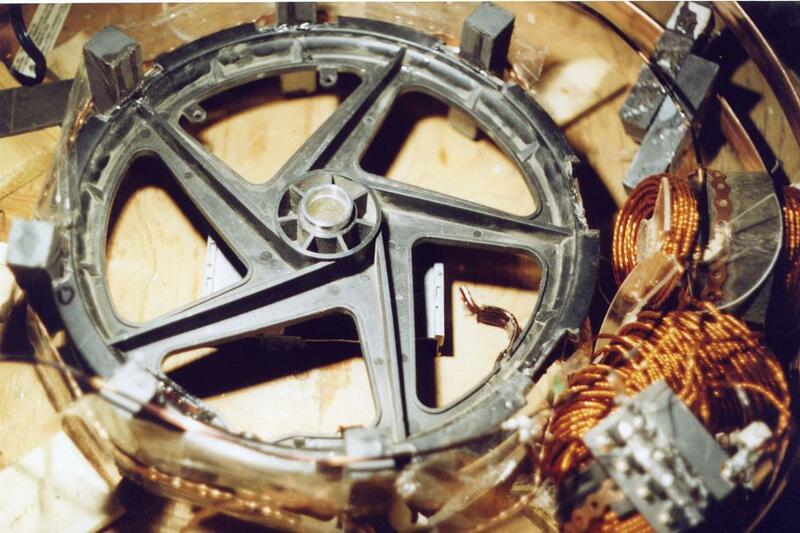 The motor generator side was wound with windings in 90 º intervals around the armature skipping every other slot which was used for the generator side. He must have used at least 36 slots/cogs on the armature. The closer the commutator segments, or higher number of segments, the shorter the impulse duration. 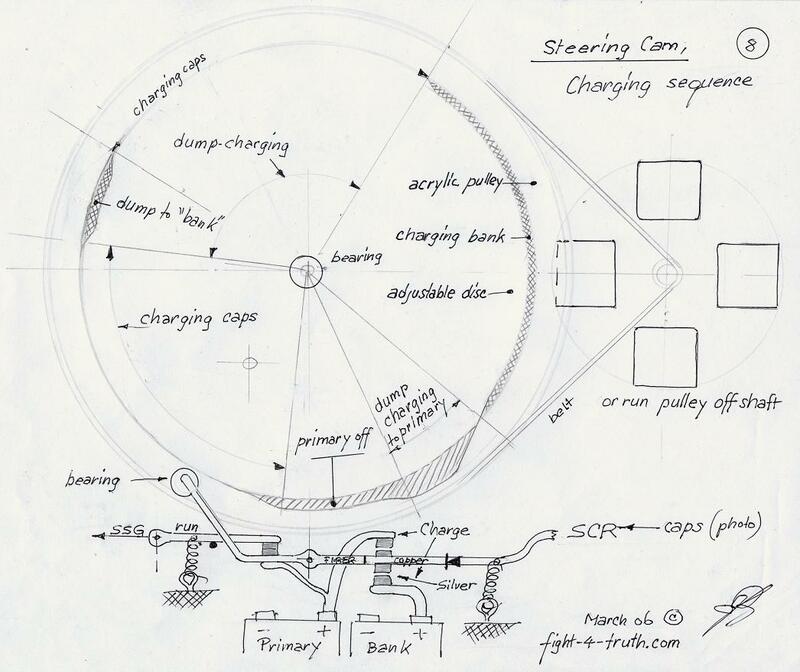 How about an alternator with a field ring of 384 pole projections and a disc armature with coils wound in one single layer which where connected in various ways according to requirements supplying sinusoidal currents from 10,000 to 20,000 cycles per second with a capable output of 10KW, which Was Employed by Tesla in His First Demonstrations of High Frequency Phenomena Before the American Institute of Electrical Engineers at Columbia College, May 20, 1891. 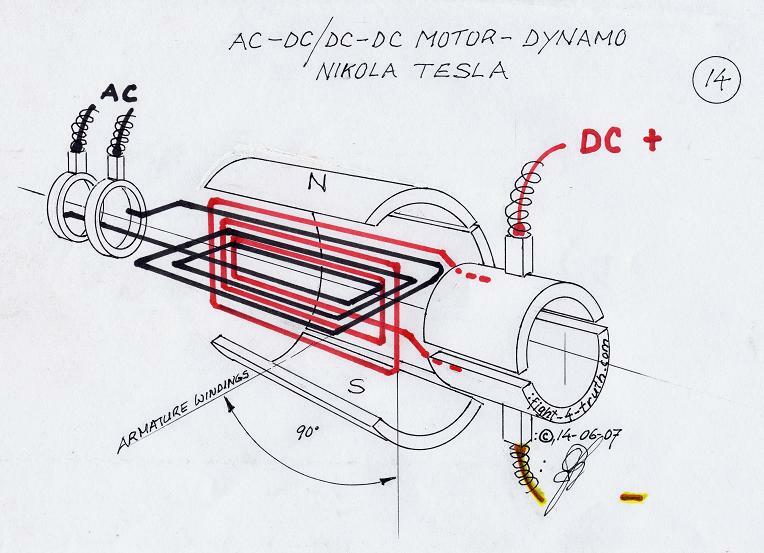 Tesla also used slip rings for AC on the generator side for converting from DC to AC for high frequency applications. the "Big Six or Eight"